I am surprised first that Nature, given its blatant bias, accepted such a paper for publication, and second that it was published so close to the Paris conference (end of this week). Perhaps they felt it would just get lost among the massive propaganda blitz that is currently going on. Right now the ice cover at the poles (Antarctic and Arctic) are each within one SD of the long-term average. 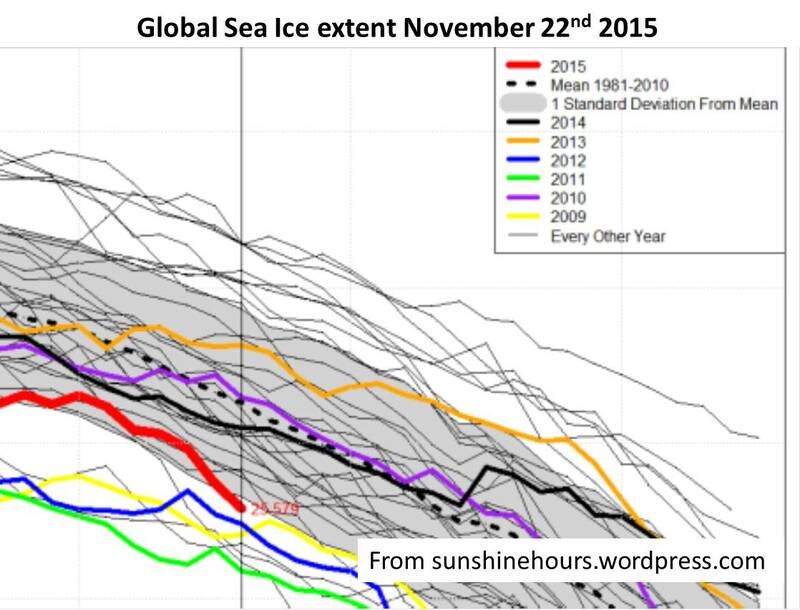 So is the global ice cover. If now any future excess melt, if it occurs, can only cause a rise of sea level of 4 inches by 2100, one wonders what the IPCC and the Paris conference are actually trying to prevent. It is not the first time that the IPCC has exaggerated (and it won’t be the last). But their scare scenarios of 1 metre sea level rise are themselves plain rubbish; which make the doomsday scenarios put out by the global warming “enthusiasts”, of upto 10 metres (30 feet) or more of sea level rise by 2100 just religious fantasy. Four inches of seal level rise is what is at stake. The risk of the Antarctic ice sheet collapsing and flooding coasts around the world has been exaggerated, according to researchers. Previous studies had claimed that melting Antarctic ice could contribute one metre to the rising sea levels by the end of the century, flooding the homes of 150 million people and threatening dozens of coastal cities. However, a team of British and French scientists has found that the collapse in the ice sheet is likely to raise sea levels by 10cm by 2100. An increase in sea levels from the ice sheet becoming unstable is “extremely unlikely to be higher than 30cm” this century, they say, describing previous, more apocalyptic predictions, as implausible. The study, published in the journal Nature, found that there was a one in 20 chance that parts of the ice sheet breaking off could contribute more than 30cm to the sea level by the end of the century and more than 72cm by 2200. The sea level has already risen by 19cm since 1901 and the annual rate has almost doubled since then to about 3.2mm a year, according to the Intergovernmental Panel on Climate Change. The UN agency predicted in 2013 that sea levels would rise by about another 60cm by 2100. The panel was unable to calculate, and did not include in its prediction, the risk of substantial parts of the Antarctic ice sheet collapsing. Some studies suggested that the risk was high and that the overall increase in the sea level would be well over a metre by 2100 once the collapse of the ice sheet was included. Tamsin Edwards, an author of the new study — which involved scientists from the University of Bristol and Grenoble Alpes University — said that earlier reports were likely to be wrong because they were based on simpler computer models which contained many uncertainties. One again, very clear evidence that the IPCC reports are mere advocacy for lobby groups. They are not scientific reports. A new study by NASA confirms their finding of 2012 that the Antarctic is gaining in ice mass. The paper is published in the Journal of Glaciology. Antarctic ice accumulation not only provides no evidence of any global warming, it is also direct evidence that the global warming hypothesis itself is flawed. This ice accumulation has been taking place while carbon dioxide concentration in the atmosphere has been increasing. Leaving aside how much of this increase may be due to human use of fossil fuel, the ice accumulation shows that carbon dioxide concentration is not a significant factor. no sensible, high-quality journal would publish the IPPC‘s work. The IPPC‘s conclusions go against observed facts; the figures used are deliberately chosen to support its conclusions (with no regard for the most basic scientific honesty), and the natural variability of phenomena is passed over without comment. The IPPC‘s report fails to respect the fundamental rules of scientific research and could not be published in any review with a reading panel. The new NASA paper shows that in recent times the Antarctic gains about 200 billion tons of ice a year while losing about 65 billion tons. Which also means that the Antarctic is responsible for about 135 million tons of water leaving the water cycle and being locked up as ice. This water can only come from the moisture concentration in the atmosphere (including clouds) or from the sea. There is no measurable change in the moisture in the atmosphere and that leaves the seas. Rather than Antarctic melting causing sea level rise, Antarctic ice accumulation is most likely reducing the rate of sea level rise due to the recovery from the last glacial. Of course the global warming orthodoxy will now tell us with impressive modelling results, that ice increasing at the Antarctic is perfectly consistent with the warming of the planet. Go pull the other one. This and the 2012 paper are in direct contradiction to the IPCC’s 2013 report which claimed that the Antarctic was losing ice. But as the French mathematicians noted the IPCC reports would not meet the normal publishing standards for scientific reports. I don’t suppose anybody will take any notice of this during the Paris wealth transfer discussions. When will any politician or government have the courage to challenge the religious orthodoxy? 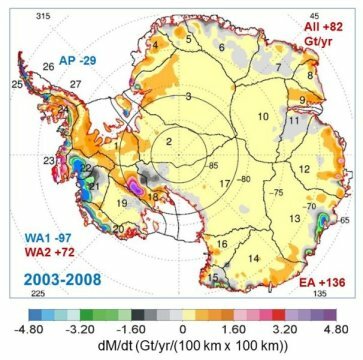 This map shows the rates of mass changes from ICESat 2003-2008 over Antarctica. Sums are for all of Antarctica: East Antarctica (EA, 2-17); interior West Antarctica (WA2, 1, 18, 19, and 23); coastal West Antarctica (WA1, 20-21); and the Antarctic Peninsula (24-27). But still the authors find it necessary to bow down to orthodoxy. That’s probably necessary to get published and to avoid being labelled climate heretics. “It might only take a few decades for Antarctica’s growth to reverse”. Right, and then again it might not. In any event, reducing carbon dioxide emissions by cutting the use of fossil fuels is of no significance to Antarctic ice accumulation – and therefore, of no significance either to any global warming that may be occurring.